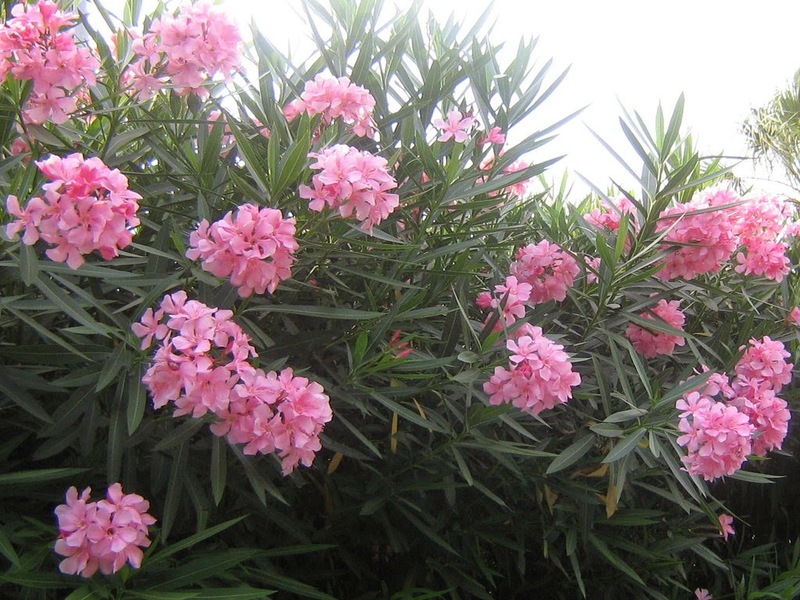 The botanical name is Nerium oleander, with a few sub-species. The main contribution to our gardens comes from the many selected hybrids giving us a huge range of useful colour forms to choose from. (Over 150 named varieties in the French National Collection). It is believed to have been growing in the United Kingdom for approximately 350 years but is native to the Mediterranean basin. It is pictured in wall frescoes of gardens in Roman Pompeii together with the strawberry tree, Arubutus unedo and was also probably used in the gardens of Conimbriga (Roman Coimbra) in the north of Portugal. It is recorded as an important component of Islamic gardens as long ago as the 11th century and also of Mughal dynasty gardens of India in the 16th century so may well have formed part of the original plantings at the famous Taj Mahal near Delhi. It has gradually spread throughout Europe and is believed to have been introduced to North America as long ago as 1786. It is shrub with a long and distinguished history of use in royal gardens – receiving the same winter protection afforded to the fashionable newly introduced exotics such as oranges and lemons in the Medici family gardens of Renaissance Italy. It is a shrub which needs bright sun and will grow in shade but flower production is reduced . It is very versatile, surviving on a wide range of soils, from dry sand to moist clay. Tolerant of high salt content soils but coastal planting may incur some leaf damage. Fastest growth and continuous flowering occurs when some water is given, it survives ordinary drought conditions If frosted foliage may be damaged, some varieties are hardier than others. Propagate either from hard wood or tip cuttings in autumn, seed is set occasionally but it is impossible to guarantee colour forms of plants grown this way. 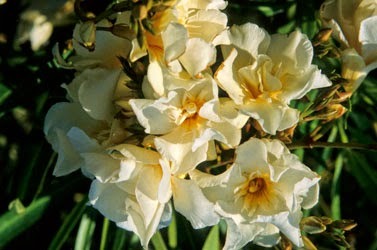 In general oleanders do not need fertilizer. Particularly useful for screening and informal hedges, (excellent for wind breaks) it is a relatively quick growing and colourful shrub for a newly laid out garden. By removing suckers, and leaving just a few stems, oleander can be formed into very attractive small trees. Prune in Sept/October to improve shape and promote heavy flowering. Flowering is on new wood so cut back just above the leaf node (where the three leaves come out of the branch) to stimulate branching - can be hard pruned. The oleander is a tough durable shrub that is inexpensive and easy to grow in most situations, best planted just after flowering – no later than September. When the terminal flower clusters smother the shrub it really stands out from the surrounding landscape. The colours vary from white, through pink to deep red with yellow, cream and scented double forms. Oleander is toxic in all parts. Contact with skin may cause reaction. We are using it to help fill out and establish green shrubby areas as it seems to be one of the few plants our wild rabbits will not eat !